Several hundred Washington and Lee law school alumni and guests returned for this year’s reunion celebration, held April 13-15 in Lexington. During the awards ceremony on Saturday, Dean Brant Hellwig announced the recipients of the Outstanding Alumnus/a Award, Volunteer of the Year Award and, a new honor, Young Volunteer of the Year Award. Parker Denaco ‘68L received the Outstanding Law Alumnus award for exceptional achievements in his career and unselfish service to his community and his alma mater. Denaco graduated from the University of Maine with a B.A. 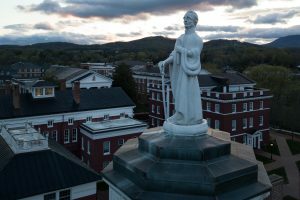 in History and Government and returned to earn an MBA in business after attending law school at W&L. Denaco was the first Executive Director of the Maine Public Employee Labor Relations Board, later to be renamed the Maine Labor Relations Board. While at the Maine board, Denaco was instrumental in the training and preparation of court mediators, served as President and Vice President of the Association of Labor Relations Agencies (ALRA), and was a founding member and director of the New England Consortium of State Labor Relations Agencies (NECSLRA). Denaco’s article “How Mediation and Fact Finding Break Deadlocks” and later articles on the organizational composition of bargaining units and the use of unit determination hearings were starting points on what had previously been a barren road map. He has been an arbitrator/mediator/fact finder in more than a dozen states and has mediated settlements for bargaining units in excess of ten thousand employees, several on a statewide basis. Denaco was inducted into National Academy of Arbitrators and as a Fellow of the College of Labor and Employment Lawyers. He served as director for Academic Collective Bargaining Information Service and for Public Employment Relations Services. He was a charter member of the Society of Professionals in Dispute Resolution as well as a founding member/director of the New England Consortium. Denaco was inducted into the University of Maine’s chapter of Beta Gamma Sigma, the international business honor society. Denaco is a former member of the W&L Law Council and has been active in both state and national bar associations. His participation in ABA sections spans the Labor and Employment Section, the ADR Section and the Judicial Division. He was co-chair of the Labor Section of the Maine Bar Association and the chair of the Labor and Employment Law Section of the New Hampshire Bar Association. 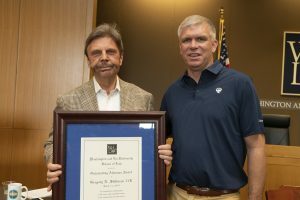 He was the recipient of the ABA Labor and Employment Law Section’s Distinguished Service award for fourteen years of service as neutral co-chair of the Committee on State and Local Government Collective Bargaining and Employment Law. The Maine Supreme Judicial Court presented him with a “Special Recognition Award” for an “outstanding contribution to the founding and success of mediation in the Maine courts.” He received the American Bar Association’s Arvid Anderson Public Sector Labor and Employment Lawyer of the Year award for 2012. Howard T. Wall ‘83L received the 2018 Volunteer of the Year award. In the 35 years since he graduated from the Law School, Wall has served on reunion committees, including the current one, served as a guest speaker to the health law society, and taught healthcare law at the Law School. His dedication to the Law School is evident in each of these roles. Wall is the Executive Vice President and Chief Administrative Officer, General Counsel and Secretary of RCCH HealthCare Partners, a Tennessee based operator of 17 non-urban regional health systems in 12 states. He comes to RCCH from Capella Healthcare where he served as the General Counsel and Senior Vice President, and from Province Healthcare Company where he spent eight years as Senior Vice President, General Counsel, Secretary and Corporate Governance Officer. Earlier in his career, Wall spent 14 years at the Nashville law firm of Waller, Lansden, Dortch, & Davis, serving as the Chairman of their Healthcare Working Group. Wall was recognized for his achievements in the field of healthcare law by being included in the first health care listing in the publication, The Best Lawyers in America, in 1989, and in all subsequent editions until he left private law practice in 1997. He has been very active in professional associations and bar activities. Howard has served the American Bar Association in a number of capacities. He served as Health Law Section Chair, Section Delegate to the ABA House of Delegates, and was a Health Law Section Council member. He currently is the Chair of the ABA Standing Committee on Medical Professional Liability. Howard is also a Life Fellow of the American Bar Foundation. He is a member of the Tennessee Bar Association and is a past officer of the TBA Health Law Section. Howard is a member of the American Health Lawyers Association and is past Chair of the Nashville Bar Association Health Law Committee. Wall is a member of the Board of Governors of the Federation of American Hospitals, an investor-owned hospital industry group based in Washington, D.C. He also serves as a member of the Editorial Board of the BNA Health Law Reporter. This Law School’s newest alumni award, Young Volunteer of the Year, was presented to Matney Rolfe ‘14L, who was unable to attend the event. A member of our Young Alumni Council, Matney has wholeheartedly accepted the call to assist our students in their job searches. The past couple of years she facilitated the hiring of six students in summer internships and two young alumni in full-time positions, through her position as Clerk to The Honorable Loren A. Smith of the United States Court of Federal Claims in Washington, D.C.